Earth Matters - In Case You Missed it: The Tropics Are Coming, The Tropics Are Coming! In Case You Missed it: The Tropics Are Coming, The Tropics Are Coming! The location of mid-latitude storm tracks are marked with an L. The location of the jet stream is marked with a dot. 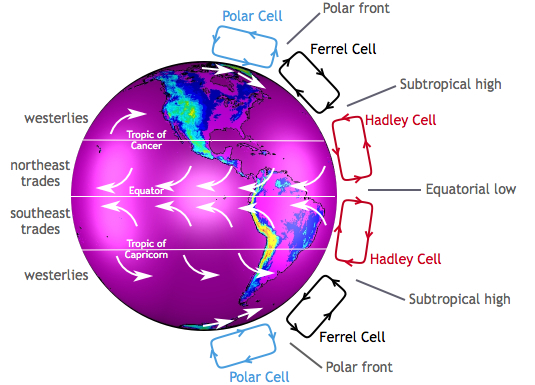 And the place where air sinks between Hadley Cells and Mid-latitude Cells is marked with an H. The left side of the chart depicts the Southern Hemisphere; the right side depicts the Northern Hemisphere. Chart by George Tselioudis/NASA. The cloud data was collected by CloudSat. The concentrations of greenhouse gases in Earth’s atmosphere have risen rapidly during the past century, mainly because of fossil fuel burning. Some of the effects of this are pretty straightforward: more carbon dioxide in the atmosphere means air temperatures will rise; ice in the high latitudes will begin to melt; and sea level will rise. That seems pretty straightforward, right? But there are some areas where the changes will be more complicated. For instance, what will all of that extra carbon dioxide means for how air circulates, for the position of the jet stream, and for how clouds are distributed in the atmosphere? George Tselioudis, a climate scientist at NASA’s Goddard Institute for Space Studies, did a nice job of explaining this as part of a post he wrote recently. In case you are not familiar with some of the scientific terms, I have added links to web sites that explain them in more detail. I also added some additional explanations to make his description a little clearer. Atmospheric circulation, when examined using a simplified, two-dimensional view (such as the figure above), is dominated by two major features. The first is a large feature called the Hadley cell, which lifts air in the Inter-Tropical Convergence Zone (ITCZ), moves it at high altitudes towards the poles, and sinks it again to the surface in the subtropical regions. The second feature is a very strong river of air, known as the jet stream, that flows from west to east in the middle latitudes of each hemisphere. The meanders of the jet stream produce the storm tracks that are the major weather makers in the mid-latitude regions. George did not include it in his post, but here is a useful chart that lays out the locations of Hadley cells and the other higher-latitude cells. Now look back at the figure at the top of this page, and let’s go back to George. The subsiding zones at latitudes between 20° and 30° North and South are noted by the letter ‘H’; the jet stream is in each hemisphere is marked with a dot; and the storm tracks are noted with an ‘L’. The circulation is superimposed on the distribution of the world’s clouds, derived from NASA CloudSat satellite observations. Areas with the most clouds are red and yellow. Note: The CloudSat data are key. There are plenty of diagrams that show how global circulation patterns work (in fact, I have included one more below). But there are few that show you where clouds actually form and, crucially, at what altitude those clouds form. Image by the Center for Multiscale modeling of Atmospheric Processes. It is apparent how the clouds relate to the circulation features. The narrow zone of uplift in the tropics produces high, thick clouds in the ITCZ (which is near the equator). The areas of subsidence in the subtropics produce extensive fields of low clouds, more extensive and deep in the southern than in the northern hemisphere, while the storms embedded in the jet stream produce deep, high clouds that extend throughout the Earth’s troposphere. It is worth looking carefully at the figure at the top of the page and tracing out the features that Tselioudis describes. Whether clouds are low or high leads to different effects on climate. Low clouds primarily reflect solar radiation and cool the surface of the Earth. In contrast, high clouds tend to have a warming effect on the surface and atmosphere. Now let us look at the key claim that Tselioudis and other climate scientists make about how global warming will affect circulation patterns. In short, scientists expect Hadley cells to expand so that the edges (where air descends) move toward the poles. In other words, the tropics will expand. Observations of the past 35 years indicate that, as the Earth has warmed, these circulation features are moving towards the poles. 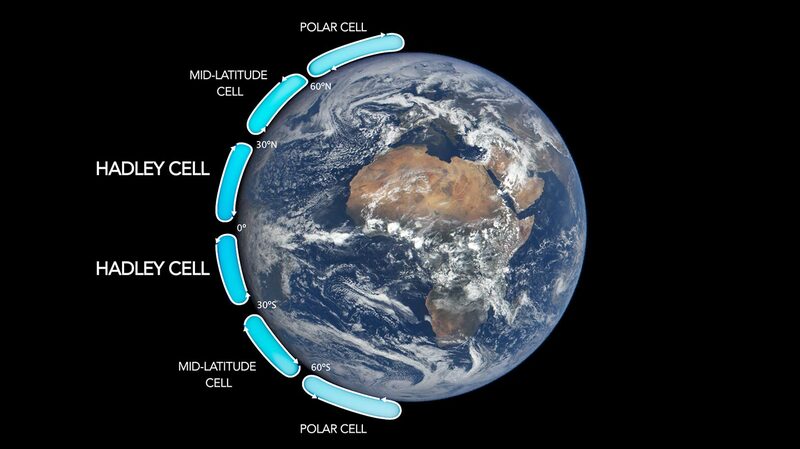 The Hadley cell shows a clear signal of poleward expansion, while poleward movement is present but less clear in the jet stream and mid-latitude storm tracks. We found that the two quantities that correlate significantly and consistently in all ocean basins and seasons are the Hadley cell extent and the high cloud field: when the Hadley cell edge moves poleward, the high cloud field also shifts towards the poles, and vice versa. However, this coordinated movement does not have the same effect in the two hemispheres. In the northern hemisphere, the poleward movement of the high clouds opens up a “cloud curtain” that lets more sunlight into the ocean surface, thus producing warming at the surface. But in the southern hemisphere, the poleward contraction of the high clouds is balanced by an expansion of the already extensive low cloud decks, which ends up blocking more sunlight and producing a small surface cooling. 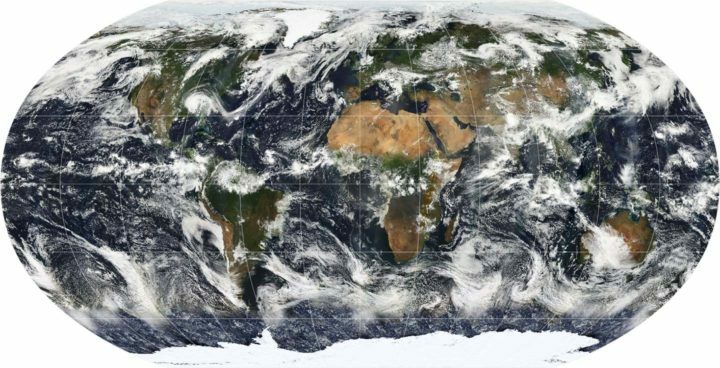 A map of Earth showing the global cloud cover on July 11, 2005, based largely on observations by the MODIS sensor on the NASA Terra satellite. Most clouds form in bands near the equator and along lines of latitude roughly 60 degrees North and South of the equator. Why does this matter? According to Tselioudis, representing this detail correctly in climate models is critical to determining how much warming will result from a given increase of greenhouse gases. Climatologists call this climate sensitivity. Many climate models do not represent Hadley Cell expansion correctly yet; specifically, the models do not account for the fact that the Hadley cells have grown wider. Tselioudis’s research shows that the models that do match real-world observations of clouds have a lower sensitivity to greenhouse gases (a climate sensitivity near 3° Celsius compared to between 4°C and 5°C). If Tselioudis is right, that is a piece of mildly good news for the planet from the complicated world of cloud climate science. For more details, read the post Tselioudis wrote for GISS. Also, take a look at this June 2017 article and this May 2016 study and news release. This entry was posted on Wednesday, July 26th, 2017 at 2:56 pm and is filed under In Case You Missed It. You can follow any responses to this entry through the RSS 2.0 feed. Both comments and pings are currently closed. In the first picture, a pressure altitude of 700 hPa seems unusual for the subtropical jet stream. It should be at greater altitude (lower pressure), no? … if it is the polar front jet, then it should be typically found at around 50-60 latitude, not that low, at 40-50 latitude. Also for the polar front jet, 700 hPa would be at unusually low altitude from my experience … I’d be grateful if anybody could help clarify.